A very useful audio amp in an 8-pin DIL package. 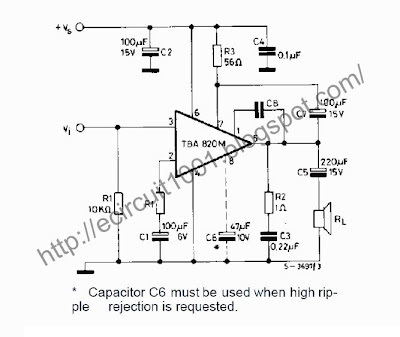 The IC features a very low minimum working supply voltage of 3V, low quiescent current, good ripple rejection, no crossover distortion and low power dissipation. Maximum supply voltages is 16 Volts into 16 Ohms speaker, 12Volts into 8 Ohms and 9Volts into 4 Ohms. The TBA820M is a monolithic integrated audio amplifier in a 8 lead dual in-line plastic package. It is intended for use as low frequency class B power amplifier with wide range of supply voltage: 3 to 16V, in portable radios, cassette recorders and players etc. Main features are: minimum working supply voltage of 3V, low quiescent current, low number of external components, good ripple rejection, no cross-over distortion, low power dissipation.